From the world's first 3D inspection equipment to cutting edge medical solutions, Koh Young Technology contributes to innovation in products, markets, and human beings. Koh Young Technology provides customized 3D measuring inspection solutions suitable to diversified manufacturing environments. 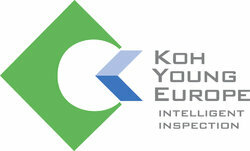 Koh Young Technology maintains the No. 1 position in the global market with independent patented technical skills that overcome existing system limitations. Customers can experience the thorough technical support of Koh Young Technology, which has sold over 13,000 machines and served over 1,900 global customers throughout the world.